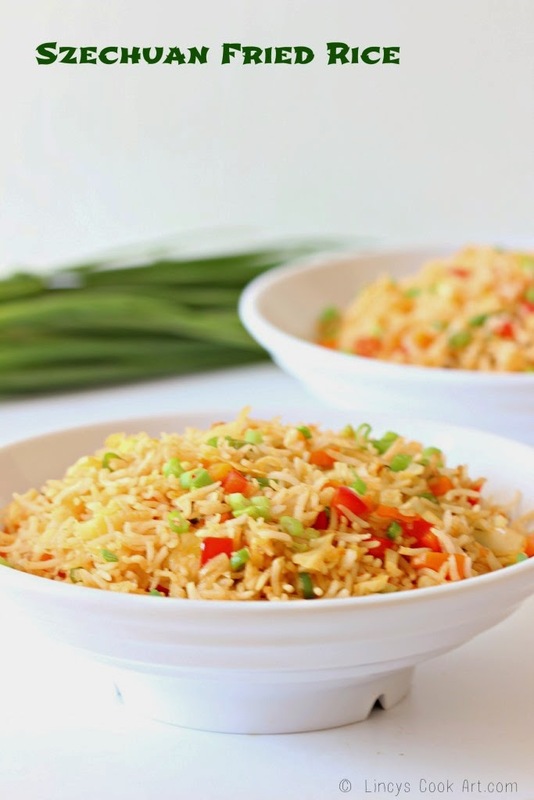 Szechuan Fired rice is an easy to make spicy fried rice item. Best alternative for the normal fried rice. A real easy to make spicy rice for the spice lovers. You can make this rice plain by adding sauces and spring onion too. I have added veggies to make it more healthy. Non vegetarians could add pieces of chicken or scrambles egg too in this rice. I make vegetable, Egg and Chicken fried rice version with Szechuan sauce. I am making this rice with home made Szechuan sauce. Easy to make in a jiffy so it suits lunch boxes. Could be served with Chilli Fish, Chilli Broccoli, Mushroom Manchurian, Baby corn Manchurian, Broccoli Manchurian, Seasame Honey Chilli Chicken recipes. Half cook the basmathi rice with salt and drain the excess water and allow to cool. Heat oil in a broad pan or wok add the chopped garlic and fry for ten seconds till the flavour arises. Then add chopped veggies of your choice like carrots, beans, cabbage, capsicum, sweet corn and little salt and a pinch of sugar. Allow to cook the veggies in low flame by constant stirring. Sprinkle little water if needed. Veggies should be cooked but the colour should not leaves from veggies. When the veggies are almost cooked add the half cooked rice, szechuan sauce and soya sauce. Season with pepper and salt. At-last sprinkle some chopped spring onion and mix well and switch off the gas.